The ArcGlobe library contains the ArcGlobe application and its associated user interface (UI) components, commands, and tools. The Application and GMxDocument objects are defined and implemented by this library. Developers can use the Application object when customizing the ArcGlobe application or working with one of the ArcGlobe extensions. Developers extend this library by creating commands, tools, and extensions for use in the ArcGlobe application. Similar to other ArcGIS Desktop applications - such as ArcMap, ArcCatalog, and ArcScene - the Application object is the core object that represents the ArcGlobe desktop application. When you start ArcGlobe, the Application object is created and, in turn, instantiates all the objects it manages. Through this coclass, you can access properties and methods for the application and navigate to other elements, such as the document, window handle, and status bar. The globe has a GlobeDisplay in the GlobeCore library that references one or more viewers, each of which has a GlobeCamera object. If, for example, you want access to a viewer's camera, you can drill down through each object in the diagram to gain access to it. When ArcGlobe is opened, there are existing layers in the table of contents. You can use the layers provided by default, provide your own, or not include default layers at all. The default layers can be modified using the methods and properties of the IGMxDefaultLayers interface. The ArcGlobe document is GMxDocument. Each running instance of ArcGlobe works with a current globe document, which is represented by GMxDocument. There is one GMxDocument per ArcGlobe session. 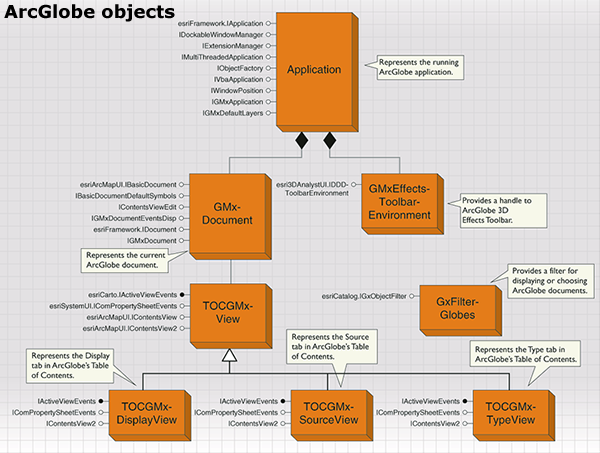 GMxDocument is cocreatable, and the ArcGlobe application automatically creates this object when the application starts. Contents views are tabs in the ArcGlobe table of contents. The table of contents in ArcGlobe differs slightly from other ArcGIS applications. 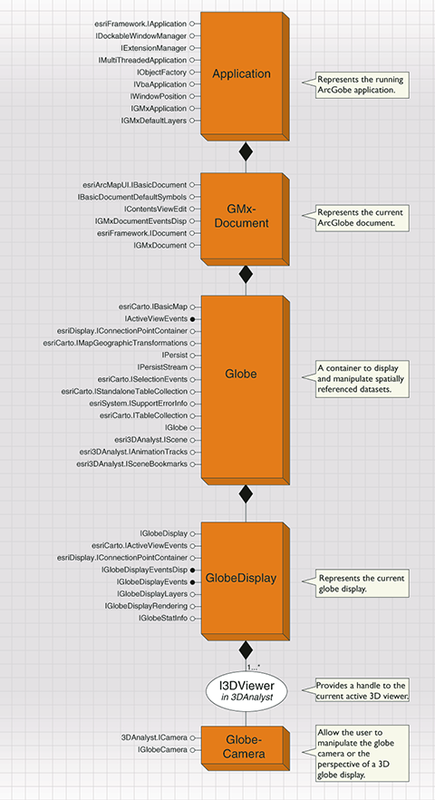 ArcGlobe ships with three contents views for displaying layers - the Display and Source pages are the same as ArcMap and ArcScene, and a third page categorizes layers by their type. The Type tab, which is unique to ArcGlobe, shows the layers in the table of contents based on whether they are draped, floating, or elevation layers. The layer ordering in ArcGlobe is a property of the Draped category under the Type tab. This layer ordering does not have a precedence in the ordering of layers in the 3D display. The Display tab is the TOCGMxDisplayView object, the Source tab is the TOCGMxCatalogView object, and the Type tab is the TOCGMxTypeView object. You can add new contents views by creating custom objects that implement the IContentsView interface. All contents views are managed by the GMxDocument object and must be registered in the ESRI Contents Views component category. The registered contents views are automatically created by the GMxDocument object when it is created. However, only one contents view can be active at a time. The IGMxDocument.CurrentContentsView property can be used to set and get a reference to the current contents view. When browsing for ArcGlobe documents (*.3dd files), GxFilterGlobes (which maintains the document filter used by ArcGlobe) determines the documents that can be opened in ArcGlobe.